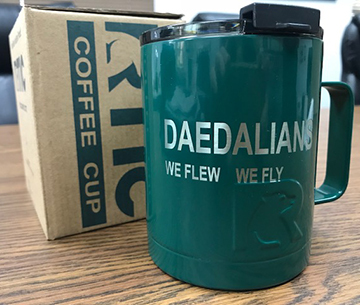 Shop our store for Daedalian-related items from the national headquarters, several flights and commercial vendors. Flights interested in selling items on this page should email their request to communications@daedalians.org. All items in this section from Daedalian headquarters can be paid for online. Prices include the cost of shipping and handling. Click on the button below the item description to place your order. 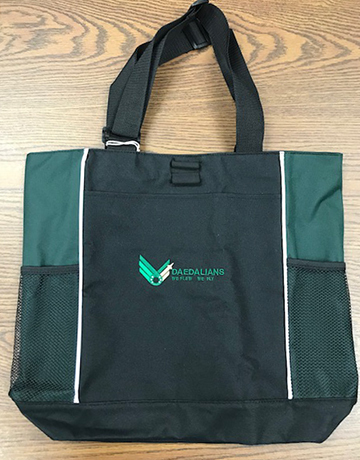 Funds generated from items sold through the headquarters are donations used to support Daedalian programs. New in the Daedalian Store! 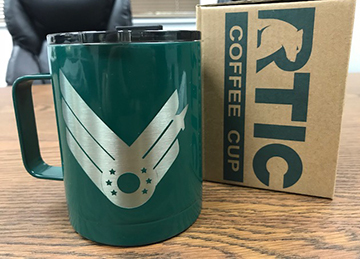 RTIC brand coffee mug, tote bag, golf towel, luggage tags and blanket! 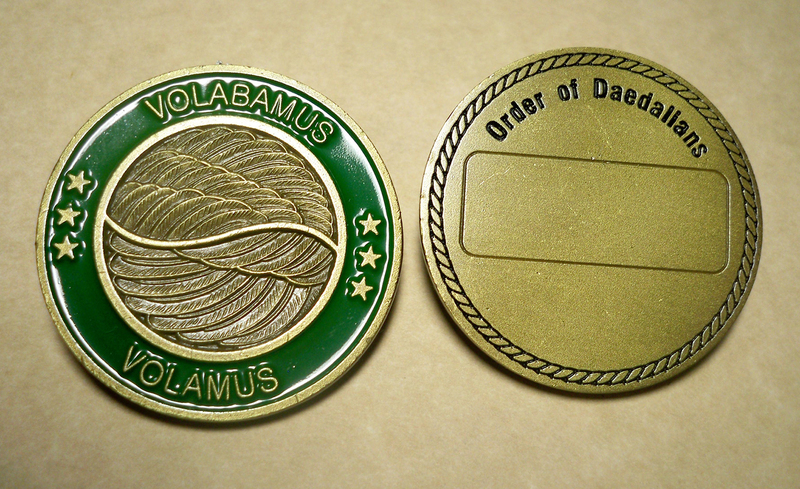 Green with laser-etched Daedalians logo. Stainless steel, double wall vacuum insulated. Splash-proof lid and flip-top closure. 12 ounces. 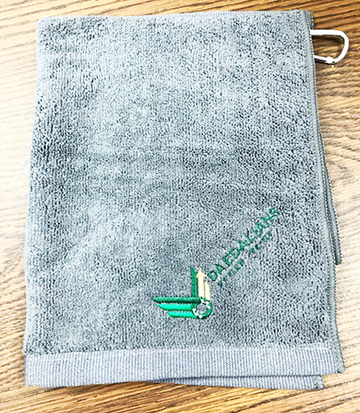 Green and black canvas with embroidered Daedalians logo. Large front pocket. Two mesh pockets on sides. Adjustable straps. Zippered. 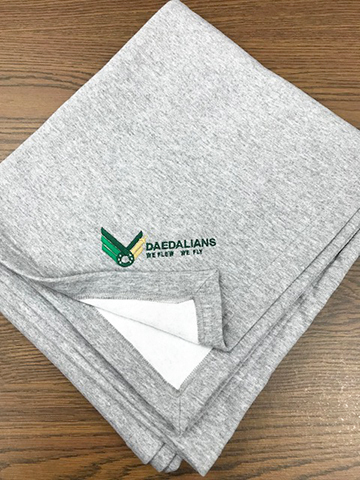 Gray microfiber fabric with embroidered Daedalians logo. Grommet. Perfect travel accessory for the Daedalian always on the go. Available in sets of 2. Gray fleece with embroidered Daedalians logo. 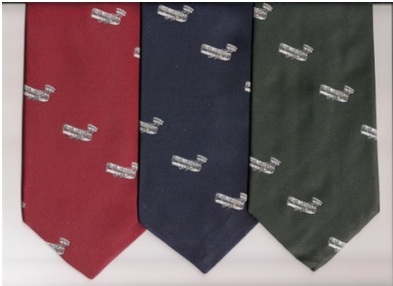 50/50 cotton/polyester. These short-sleeved T-shirts made of a 50/50 poly cotton blend are available in S, M, L, XL and XXL. 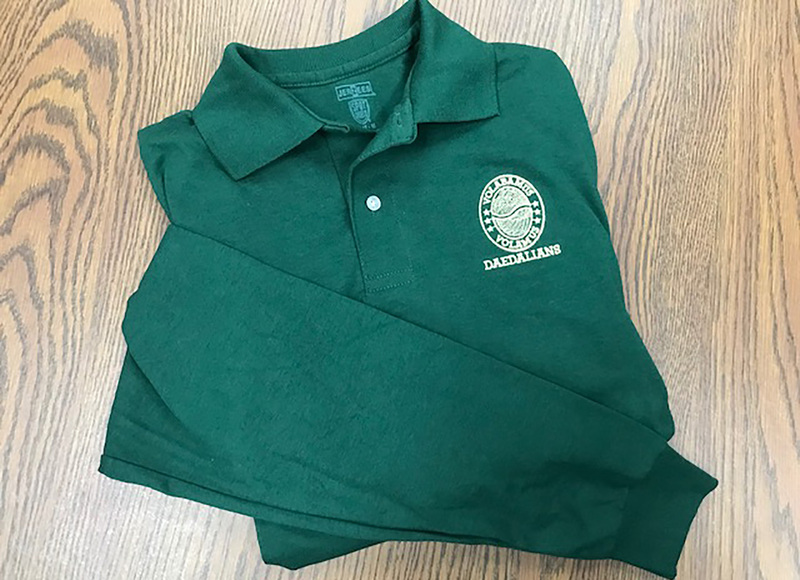 Children’s sizes are available in S, M and L.
Short-sleeved 3-button polo shirts available in Daedalian gold or green in men and women’s sizes from S to 2XL. Allow up to 2 weeks for processing. Long-sleeved cotton 50/50 blend, 3-button polo shirts available in hunter green, white, black, navy, royal blue, red and grey. Can take up to two weeks for delivery. In sizes S – XXL. 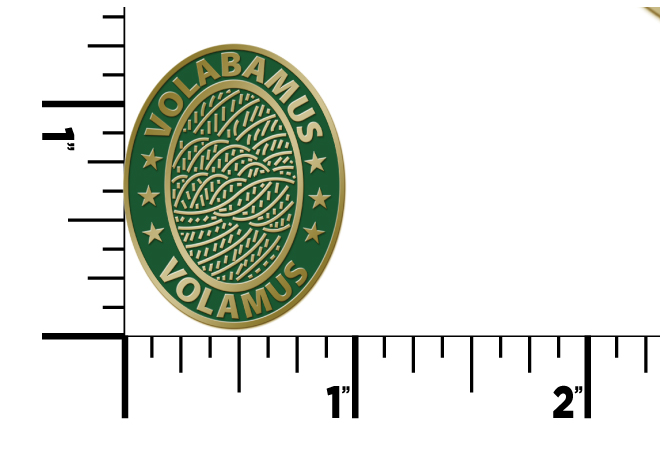 2 inches by 1 inch lapel pin of the Daedalian Logo: We Flew We Fly. 1 inch by 1.25 inch enamel pin with butterfly clip. 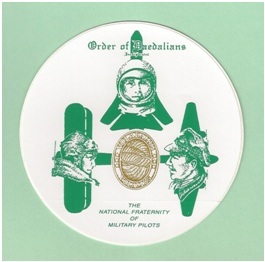 Traditional seal of the Order of Daedalians. 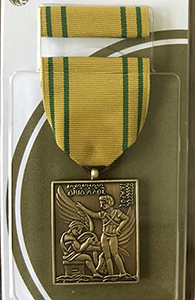 These medals are awarded to Junior ROTC students based on guidelines found at https://daedalians.org/programs/jrotc/. PLEASE NOTE: Daedalians presenting medals to students are asked to contact headquarters directly for the Daedalian rate. Write to info@daedalians.org or call 210-945-2111. This large resin crest measures 23.5 by 19.5 inches, and is made with a wall mount on the back to hang on podium or wall. 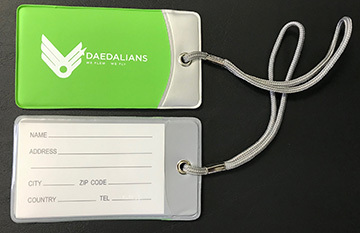 Personalized address labels with the Daedalian logo. Matte white 3 by 0.625 inches. Two sheets with 32 labels per sheet. Include what you want labels to say in comments section on order form. 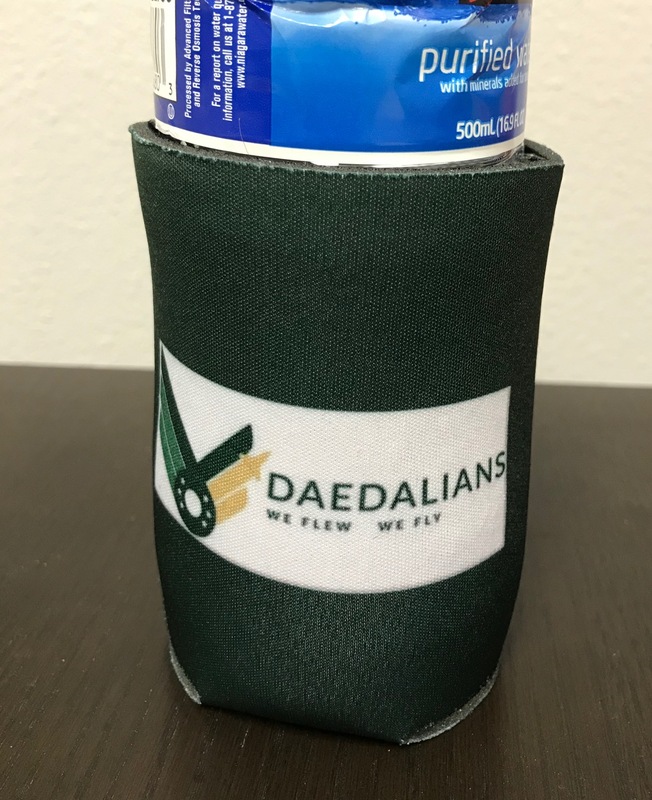 Keep your drinks cool with this hunter green koozie featuring the new Daedalian logo. 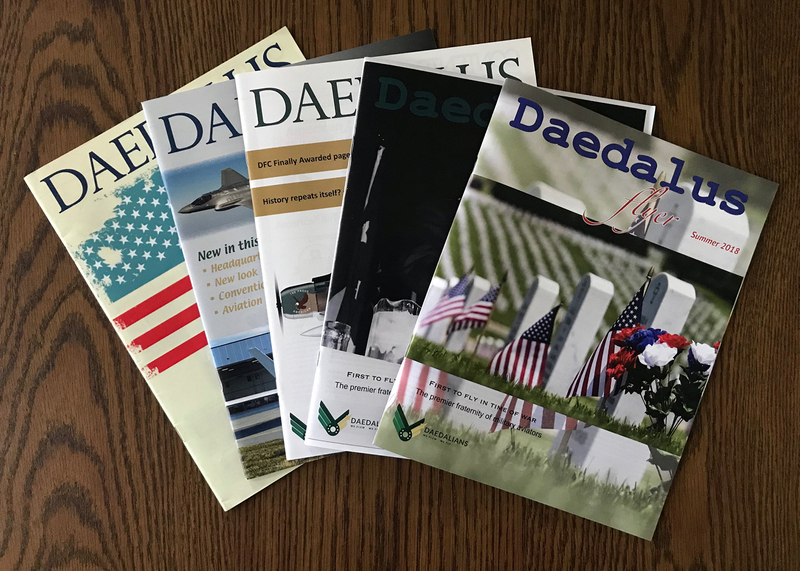 Order past issues of the Daedalus Flyer at no cost to you. Contact us at membership@Daedalians.org for information. Order these items directly from the sponsoring flights. 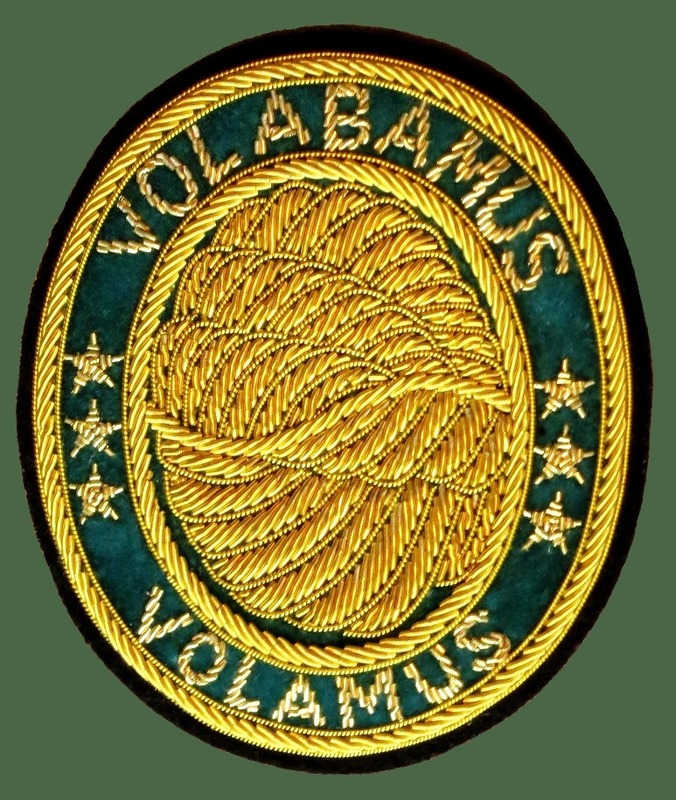 The traditional Daedalians Blazer Patch, featuring gold bullion (metallic) thread, is custom made by the Vanguard Corporation, supplier of uniform insignia to all U.S. Armed Forces. 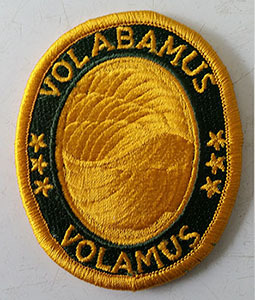 The patch attaches to the blazer via three clutch pins and features detail of a higher accuracy than any previously available bullion-embroidered patch. 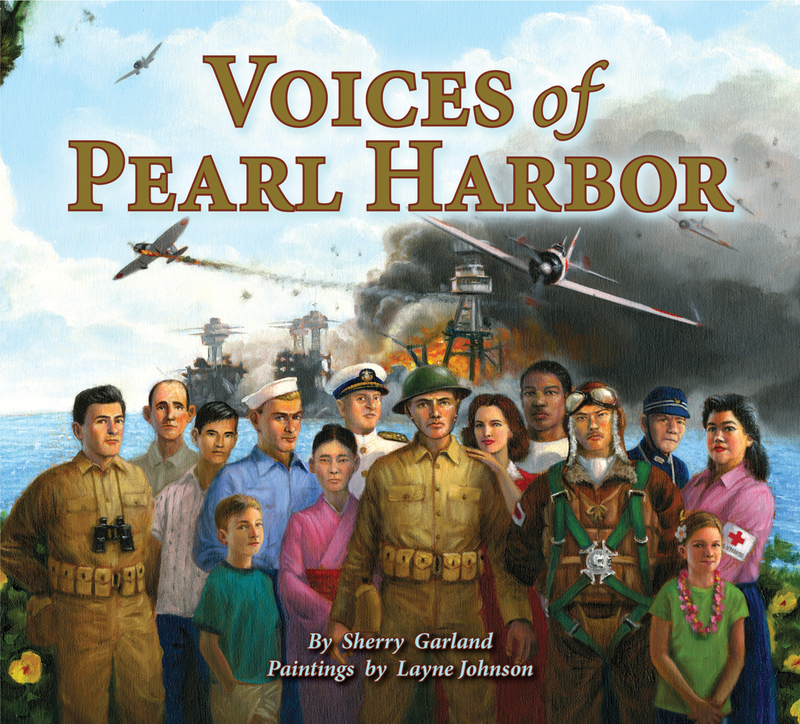 To order, contact Flight 99 Adjutant Mike Buck at mikeandsheridanbuck@gmail.com or 406-836-9857. Mail-in orders are also accepted. 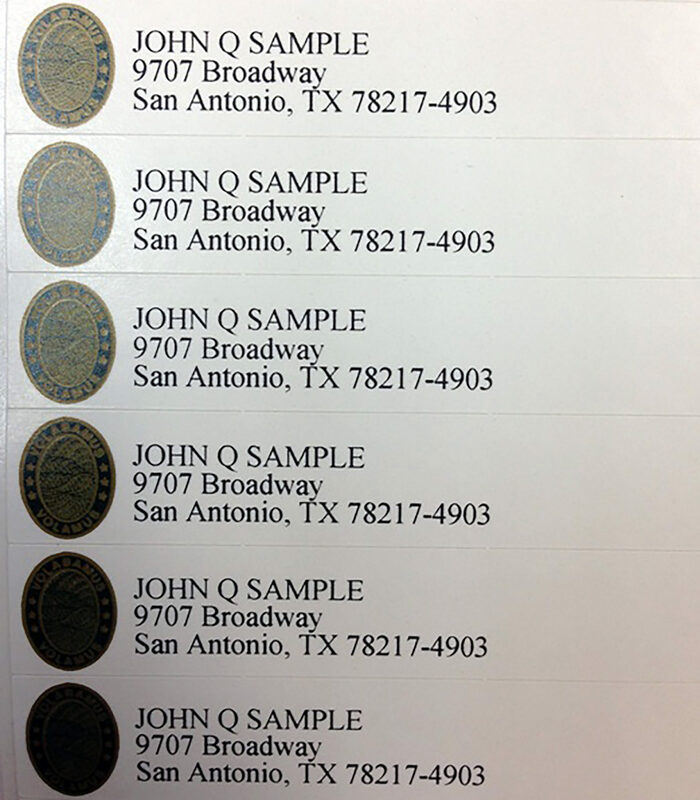 Please provide the number of patches you wish to order, your name, mailing address and phone number. Make checks payable to Big Sky Flight 99. 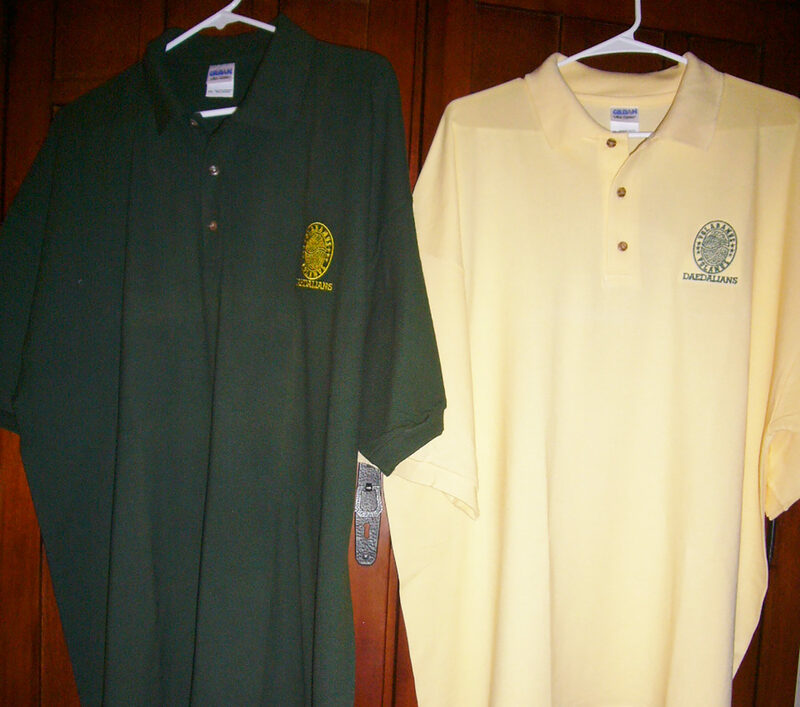 Daedalian golf shirts are made from a quality polyester and cotton material with a richly embroidered Daedalian crest. 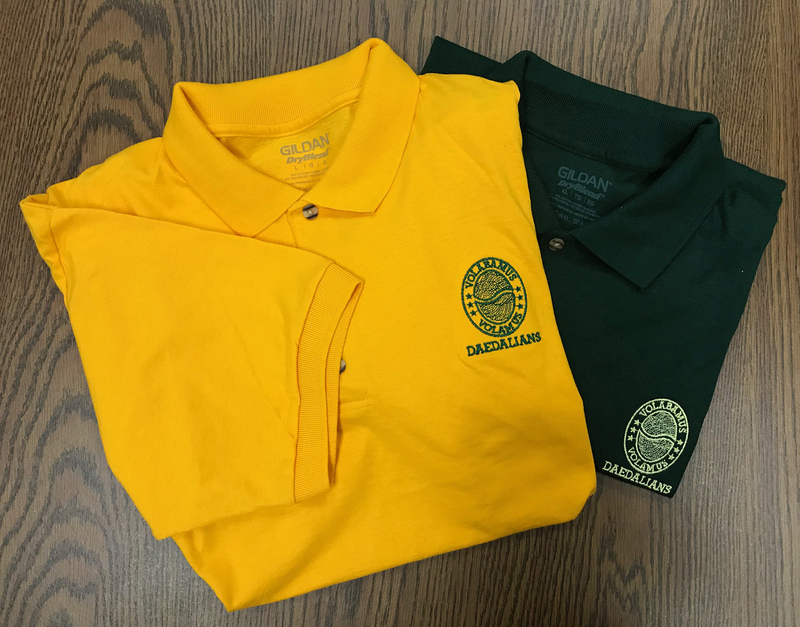 Shirts can be ordered in maize with green embroidery or green with gold embroidery. The shirt is available in sizes M, L, XL and XXL. The aloha shirt features Daedalian theme-oriented aviation prints in green on an off-white weaver’s cloth. It is a spectacular pattern on a good Hawaiian fabric and comes in sizes S, M, L, XL, XXL and XXXL. Expect delays; 28th Flight deals only in bulk orders from the factory. Sizes may run on the small side. The vinyl window decal is 4 inches in diameter with the mastic on the back. 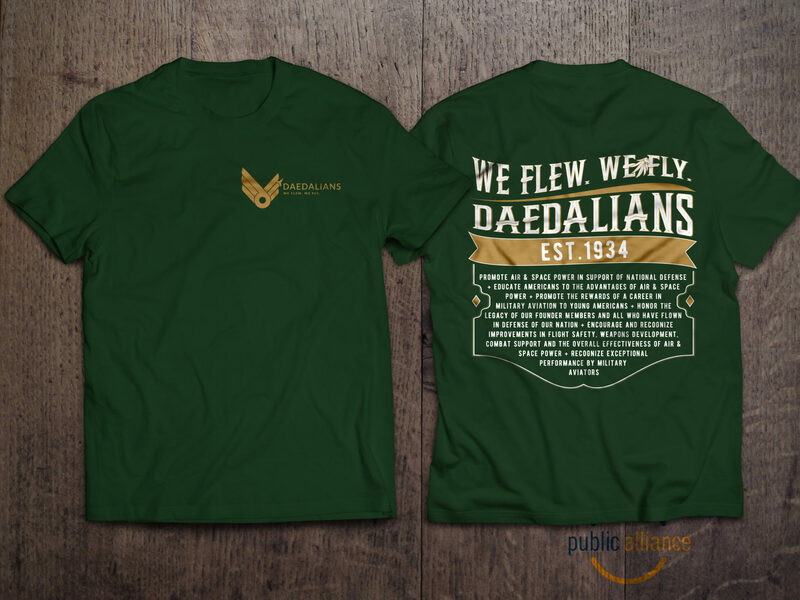 It depicts the Daedalian logo in gold and green on white. Postage for 1-3 coins is $1.75, 4-6 coins is $3, 7-9 coins is $5, 10-14 coins is $7. 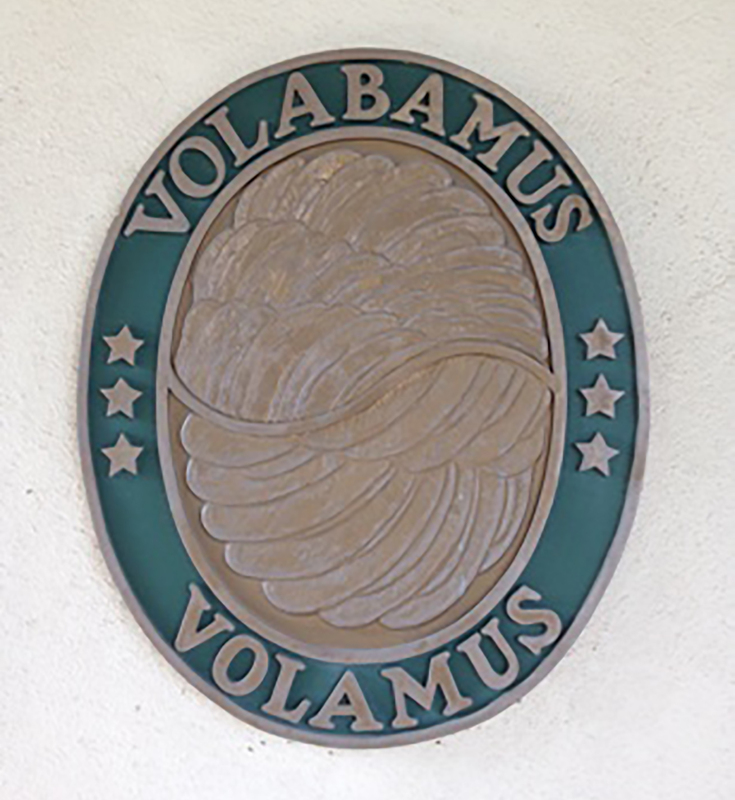 Coin, 1.5 inches diameter, official colors. Use for personal keepsake, flight gifts, coin collectors. Plenty of room on reverse to engrave your name, Daedalian number, named member, flight number, etc. Order these items directly from the vendor. Blazers are available through Men’s Suit Separates in our Daedalian color of hunter green, and are 55% polyester and 45% wool. When worn with the Daedalian blazer patch, they create an aura of congeniality and comradeship. They make members stand out. If blazer patches are provided to Men’s Suit Separates, they will sew the patches on for an additional $10. Wheat/natural colored 100% brushed cotton twill adjustable baseball-style caps, with the oval Daedalian crest (in hunter green and gold) digitally printed on the front, are available through 68th Flight (Spirit). For payment with cash, check or money order, send the order and payment to the address below. Credit card orders may be placed by phone or via www.arizonacap.com/daedalians.htm. Allow 10 days for shipping. 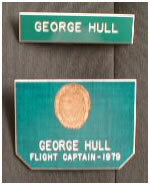 The larger tag, bearing name (and office title if desired) and a replica of the Daedalian crest is usually worn alone. The smaller tag with only the name is worn on the Daedalian blazer above the Daedalian blazer crest. 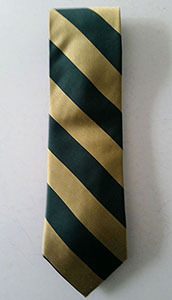 Tags are pine green with gold emblem and text. If you wear miniature wings, they should be worn 1/2 inch above the name tag. Garden State Flight 43 is proud to present the Brig. 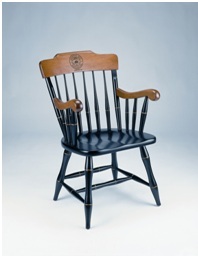 Gen. David Lee “Tex” Hill memorial chair, with all profits donated to the Daedalian Flying Training program. The chair is American-made, heirloom-quality, maple hardwood. The crown is laser engraved with the Daedalian crest. You may add personalization (name, rank, affiliations) under the crest. These chairs have been made in Gardner, Massachusetts, since 1938 by the same company who makes chairs for major universities and other organizations.